Is it play time yet? 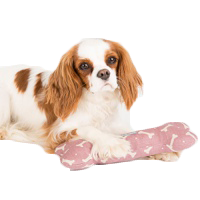 Spoil your puppy with one of our luxury puppy toys. We have toys for the girls including the Sniffany Box and Bone and the Stella MuttCartney Shoes and we have toys for the boys too including the Bark Street Journal, IBone and IPaw'd (the famous Apple iPhone and iPad but in a squeaky form!) For the more sophisticated pups, we have some luxury organic ticking linen squeaky dog bones that are all handmade to order for us by Mutts and Hounds here in Britain! Go on, give the dog a bone! You’ll need squeaky toys, chew toys, tug toys and more to keep your puppy entertained. Our great range of puppy toys are sure to satisfy your needs. Our Stagbar deer antlers make the perfect teething chew for your puppy and our squeaky bones by Mutts and Hounds are perfect for driving you crazy!